Located 1.3 km from Byron Bay is the still active Cape Byron Lighthouse. A must visit attraction in the area, the walk to the lighthouse and the lighthouse itself offer stunning views of the coast. It is Australia’s most powerful lighthouse and is operated by the Australian Maritime Safety Authority. It receives over 500,000 visitors each year and is a popular whale-watching site. The Maritime Museum below has informative displays about the maritime history of the region. 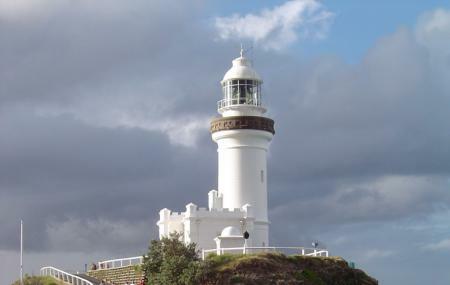 The Byron Bay Lighthouse can also be accessed on foot via the Cape Byron Walking Track. There is a cafe and souvenir shop on site as well. It can be a busy place on the weekend so parking might be limited. Cape Byron Lighthouse is not accessible by wheelchair; however the area outside the lighthouse is flat. Vehicle entry fee for Cars $7 AUD per hour; Motorbikes $3 AUD per hour. Maritime Museum 10:00 am to 4:00 pm daily. How popular is Cape Byron Lighthouse? People normally club together Farmer's Market and Cape Byron State Conservation Area while planning their visit to Cape Byron Lighthouse. People also prefer to start their day with Cape Byron Lighthouse. Amazing location. Take your time and walk up if you can. Driving is lovely too, but parking is a bit of an issue. There are not many spaces available right at the top, and they police it like hawks! So be prepared to pay...the views in all directions are a knockout, and the local beaches are gorgeous. You could make a whole day of the beaches and lighthouse if you can sort out food. You will have to go back into Byron for food otherwise. We just stopped off here on our way down the coast. There is limited parking, but most people don't stay long, so parking is always changing. We parked at the first available place. Then walked to the light & cafe. The views are spectacular & there are plenty of choice of walks, depending on how far down & back up you want to go. We had a lovely ice cream from the cafe. Good price to. The toilets were clean . Wonderful place with some breathtaking views from the top where you will get some epic scene of vast sea. You will feel like sitting there and just admire the view. Go with your close friends to have some fun. Highly recommended this place to everyone. There is beach down from the lighthouse for any who loves to swim. Great scenic spot overlooking Byron Bay. Very little parking at the top, with more halfway down the hill. Classic lighthouse design. Cafe by the side of the lighthouse selling cold drinks, coffee, etc. Good spot for weddings, but you probably need a coach to get the guests there and back.